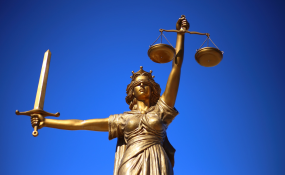 Lady Justice, an iconic image of the legal system (file photo). Kampala — The Judicial Service Commission (JSC) has opened up a general inquiry file into allegations of sexual harassment of female judicial officers by their bosses. In an October 22 letter, the Chief Registrar of Courts of Judicature, Ms Esta Nambayo, urges all the affected officials to register their complaints in confidence. They have been asked to approach JSC commissioner Christine Amongin Aporu or principal legal officer Melody Ginamia. The sexual harassment allegations were raised at the JSC performance management workshop for Kampala and Luwero circuit on September 20. Alternatively, the Chief Registrar advised the affected officers to seek an appointment directly with Ms Aporu and Ms Ginamia. During the September workshop that was held in Seeta, Mukono District, the lower judicial officers decried excessive work and sexual harassment by some of their bosses. They said because of too much work, many of them have failed to get married and that those married have since opted out. The magistrates also revealed that some men fear approaching female judicial officers because of the nature of their work that puts them in a very high class. Another magistrate, Ms Carol Adong, explained that some of their families have ended up being polygamous due to frequent transfers that usually take them far away from their immediate families. "Our husbands end up getting other women near them just because we only turn up once a month depending on the distance like Gulu District," she said. The Chief Registrar's letter is also copied to Chief Justice Bart Katureebe, Deputy Chief Justice Alfonse Owiny-Dollo, Principal Judge Yorokamu Bamwine, the JSC chairperson, Justice Benjamin Kabiito, and Secretary to Judiciary Kagole Kivumbi.